While doing a little surfing through various golf websites, I discovered the transcript of yesterday’s press conference with Tiger Woods. The daily scribes all make an attempt to ask El Tigre penetrating questions, sort of like they have an interview with St. Peter at the Pearly Gates. The verbiage is flying and the descriptive clauses are tacked on to every noun. Sometimes it's a wonder how Tiger can decipher the exact answer. On the other hand sometimes Tiger doesn't want to. Reading the questions is far more entertaining than the stock answers. It reinforces my theory that those of us working in the non-traditional media put our thinking caps on before trying to sound like Chris Matthews on steroids. 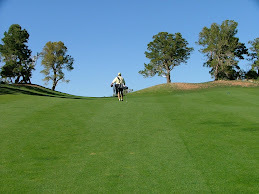 QUESTION: As a budding golf course architect, when you come to a new venue, come to a new community that has such a historic golfing tradition, do you approach it a little bit differently than when you were just playing, or have you always taken the mindset that, could I come here and design a golf course in place like that? My question to this venerable scribe: How do you have a new community with a historic golfing tradition?